Kalabi : Music for Televisions. 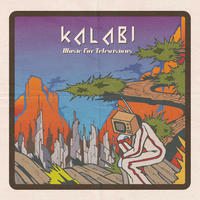 "Music For Televisions" features a more stripped back production style from Kalabi. The melodies and hooks are still here, but the delays and special effects have been turned down. Kalabi decided to go back to his early days of music making, when there were limited tracks and limited hardware. So, using only eight tracks for each song, and using only analog modeled keyboards, he has made an interesting addition to his growing catalog.